ADATA Technology, a leading manufacturer of high performance DRAM modules, NAND Flash products, and mobile accessories is proud to announce that the SD700 external 3D NAND SSD has been bestowed with a Good Design Award 2017. Hosted by the Japan Institute of Design Promotion, Good Design Awards (or “G Marks”) are considered among the most prestigious and respectable design accolades in the world. The SD700 was selected by the Good Design panel for its delivery of professional-grade durability in a highly compact, portable, and lively design package. The SD700 boasts IEC IP68-rated dust and waterproofing plus US Army MIL-STD-810G shock resistance, yet does not resort to a bulky or rough appearance. Instead, ADATA designers have achieved an appealing multi-element presentation, with a pliable wraparound material co-existing alongside a tough internal shell. The SD700 fits easily in the palm of a hand and weighs just 75g. It is offered in yellow/black and all-black color scheme options. 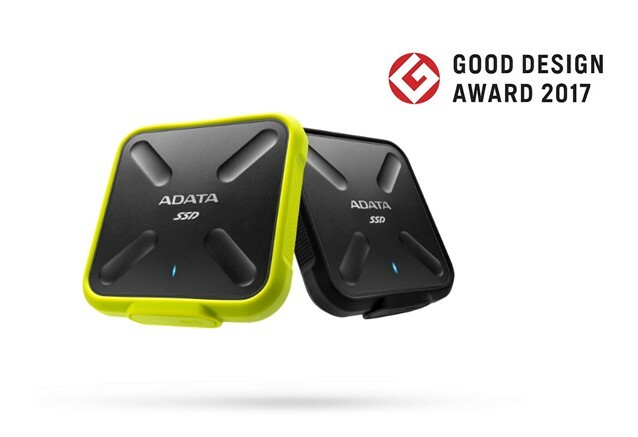 ADATA is truly honored that the SD700 has secured a place among the select few chosen for a 2017 Good Design Award, showing it is indeed in esteemed company. The SD700 was selected from many hundreds of entries, indicating its dual successes as technological innovation and work of art. The SD700 offers consumers a 3D NAND SSD capable of up to 440MB/s read and write, four times faster than ruggedized external HDDs. Its 3D NAND enables higher density, faster performance, and increased reliability compared to older 2D NAND. The SD700 is available in up to 1TB capacity, and provides near universal compatibility via USB with PC, Mac, and game consoles.